For those currently participating in the pilot, Bing Shopping Campaigns offers deeper granularity, more flexibility and better insight into your Product Ads performance. Best of all, setting up your Bing Shopping Campaigns is easy! Today, we will focus on tracking and viewing performance statistics for Shopping Campaigns in Bing Ads, or, step 4 ( Reporting & Optimization) below. If you are not familiar with the previous steps, you can learn more about each by following these links: Claim your domain| Set up your BMC Store | Upload a feed | Setup Shopping Campaigns. You can track the performance of your Bing Shopping Campaigns in 3 ways, using the Product Groups page, Reports, or Dimensions tab. 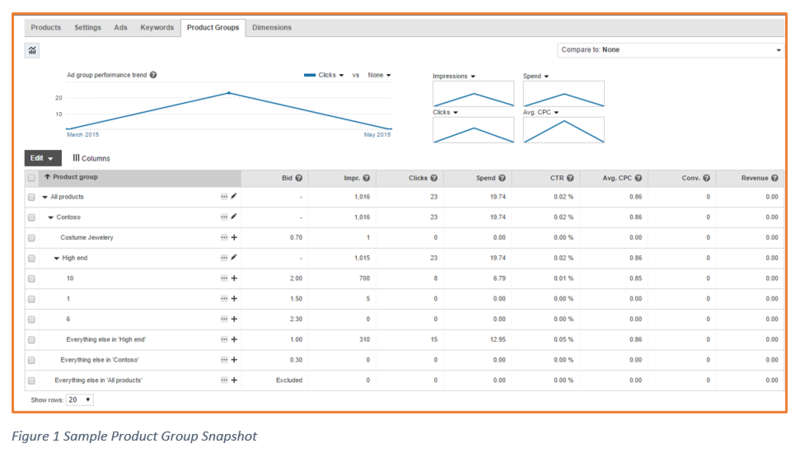 You can view the performance data - Maximum Cost per Clicks (Max CPC), Impressions, Clicks, Spend, Click through rate (CTR) & Conversion Metrics by clicking on the tab: Product Groups. These metrics are available on all levels of your Product Group. For flexibility and ease-of-use, you can also customize the columns with what data you want to see. Data for Bing Shopping Campaigns will no longer be available in the Product ads reports (Product target and Product offer report). Instead you’ll want to use the Product Partition Report or the Product Dimension Report. The Product Partition Report gives you aggregated data at each level of the product group. If multiple segments are used to more granularly target your product group, you will get more than one row of data per product group in this report. The Product Partition report would have data for All products represented as * in the report. *\Brand = Contoso\Custom Label 0 = High End Jewelry, etc. In the Product Partition report, an impression or click associated with a product appears in all the levels that contain the product. Filter on the Product Group column for only * and add those rows to get totals across campaigns and ad groups. This occurs due to the presence of overlap. The report only reflects the current state of the product group at the time it was generated. This report provides statistics at the product level [Merchant Product Id / MPId]. You will also be able to view other product attributes such as brand, category, custom labels, etc associated with that product captured during the time of the event. You can use this report to track how your offers have been performing and adjust your bidding strategy and targeting based on that. Each of these views are pivoted across one particular dimension based on the feed that you have set up, e.g. Shopping Item ID view has statistics against each merchant product ID. Similarly, if you look at the category view, it will have statistics pivoted against the set categories you have in your feed. This information can be very helpful if you want to drill deep into your performance metrics to figure out how your products are performing. Product Ads are created based on the feed data that you have provided in Bing Merchant Center, so report results are closely tied to your feed data. Unlike the traditional PA campaigns, all the reporting for Bing Shopping Campaigns are at the product level so you need to ensure that your feed data is accurate and updated. Go beyond the list of required attributes by using the below recommended attributes so that you have a more granular campaign structure and richer reporting information. o Custom Labels – very helpful if you want to group your products based on Best sellers, High/Medium/Low ROAS, Seasonality etc. o Bing Category – categorize products at the lowest categorical level, example: Apparel & Accessories > Clothing > Outerwear > Coats & Jackets > Blazers. This helps to ensure that we pick the right product for the right query. o Product Type [Merchant defined taxonomy] – again, very useful if you have a different internal taxonomy that you want to map your products to for easier management. List of other helpful attributes, which can be used to provide richer information. For better performance of your Product ads, the image you upload against your offer is a key contributor. Images with a white background and a high resolution tend to perform better when compared to others. Ensure that the image you upload has a high resolution and is at least 220x220. Utilize Bingads Redirect – this will allow you to add third party tracking and track redirects. Import your Google Shopping Campaigns where applicable and remember to check the import summary log for any errors. o If you are not sure where to start out on bidding use the same bid as similar text ad campaigns and tweak it based on your ads performance. Utilize the search term report to negate and search terms you may deem irrelevant to your BSC campaign. 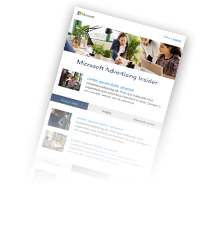 Learn more about Product Ads here, and stay tuned for our announcement on when this program will be widely available to all advertisers beyond the pilot program.